Bill Bass played his college ball at Tennessee State and the University of Nevada - Reno. 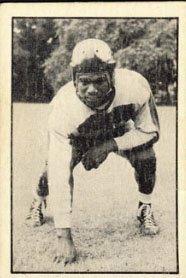 Bass went on to play one season, dressing for 14 games with the Chicago Rockets in tghe AAFC in 1947 before joining the Alouettes in 1948 as one of the first African-American players in Canada. Bass went back to the States in 1949, trying out with the Chicago Hornets. Bass returned to play in Canada in 1950 with the Toronto Argonauts. Bass would go on to play four seasons in Toronto (1950-53). Under the rules of the day, Americans who played four consecutive years in Cnada were reclassified as non-imports. In a strange twist of fate, this cost Bass his job with the Argos. In 1954, a new rule limited the number of such American-Canadians to three, and Bass was placed on waivers by Toronto to get down to the limit. Bass was picked up by the Ottawa Rough Riders where he would spend one season (1954). Bass finished his football career in Canada in 1955 as a player-coach with Toronto Balmy Beach of the ORFU. There are few stats for Bass as most individual stats othe rthan scoring were not kept in the East until 1951. Bass, however was an excellent halfback, winning an East All-Star in 1951 (there ere no CFL All-Stars until 1962). In 1951, Bass was also one of the Argo nominees for the Jeff Russell trophy, awarded to the most valuable player in the East. Bill Bass passed away on September 28, 1967. Note: If Anyone has more information about Bill Bass such as his precise DOB, lease let me know via the Contact Me link above. Prior to 1954, the only individual stats kept in the East were scoring stats.